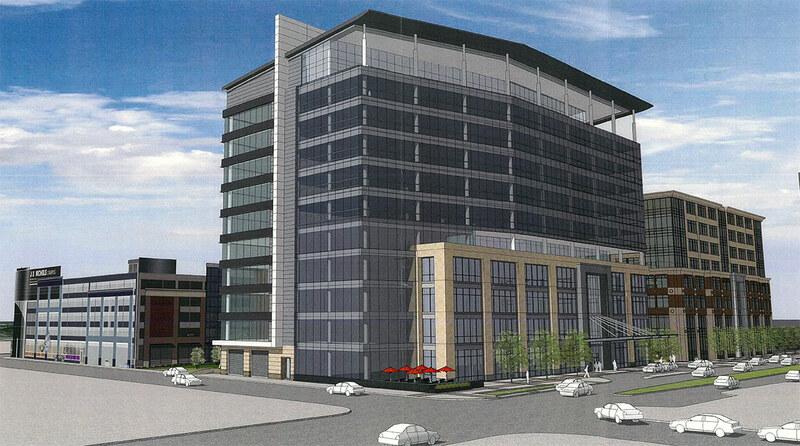 There’s another large building slated for the eastern edge of Downtown Louisville. 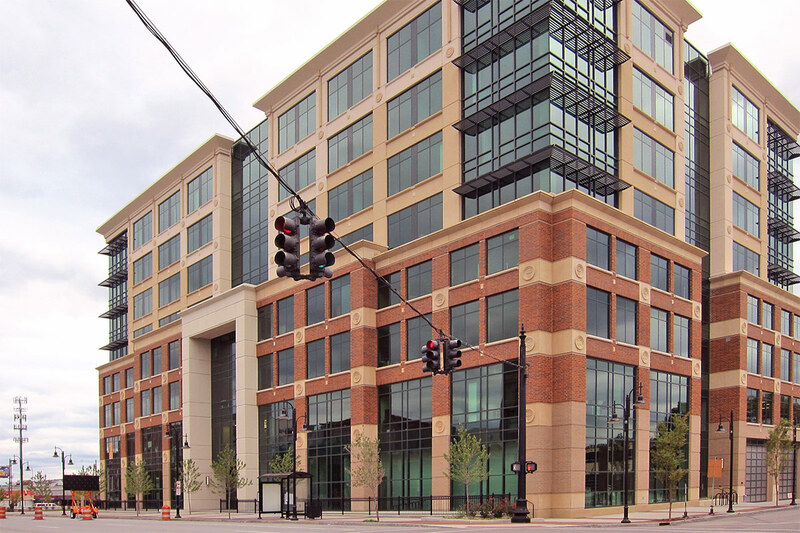 Last Friday, the University of Louisville Foundation‘s real estate arm and NTS Development Company submitted their development plan for the next project at the J.D. Nichols Campus for Innovation & Entrepreneurship, aka the Nucleus block. 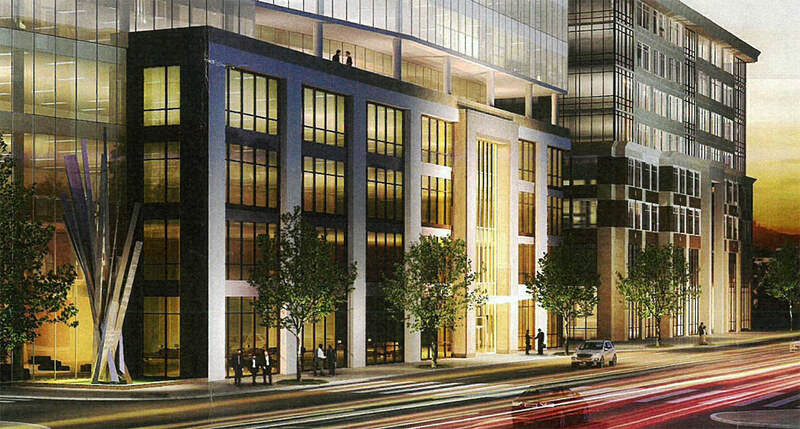 The new 11-story, mixed-use structure at 350 East Market Street, known simply as “Building Two,” would sit next on the southwest corner of East Market Street and Preston Street. This is the third structure the foundation has built on the site since Nucleus was formed in 2008. 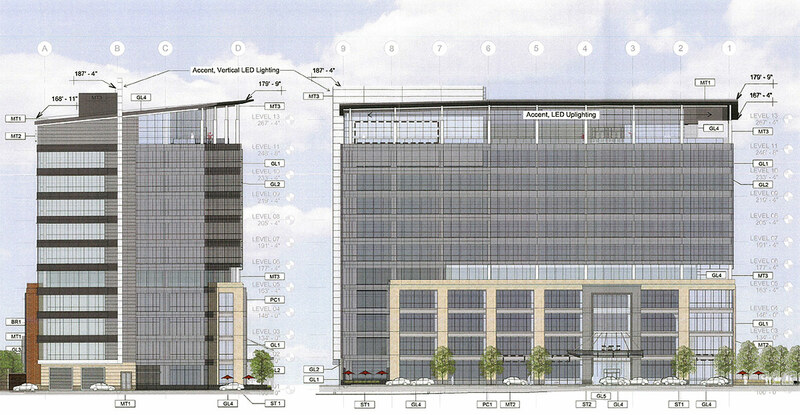 Directly east of the proposed building site is an eight-story building called Atria Support Center at The Nucleus, named for Atria Senior Living, which houses a variety of office users over its roughly 200,000 square feet. That structure was designed by Louisville-based Arrasmith, Judd, Rapp, Chovan and opened in 2013. 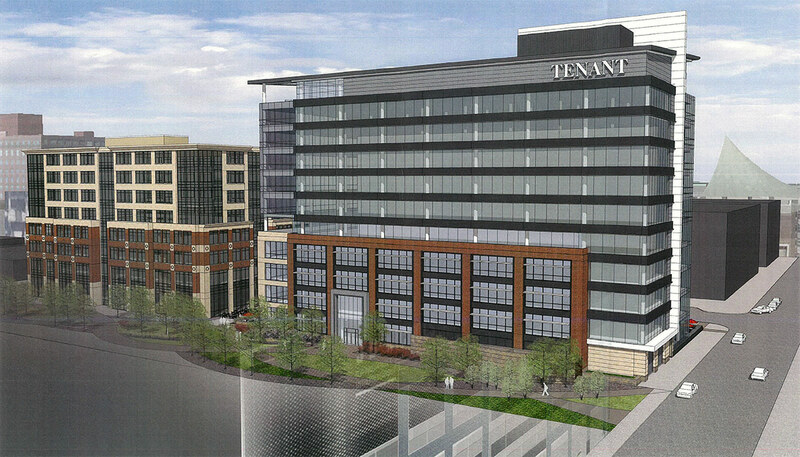 To the south of the 1.2-acre building site is a massive 832-space parking garage. 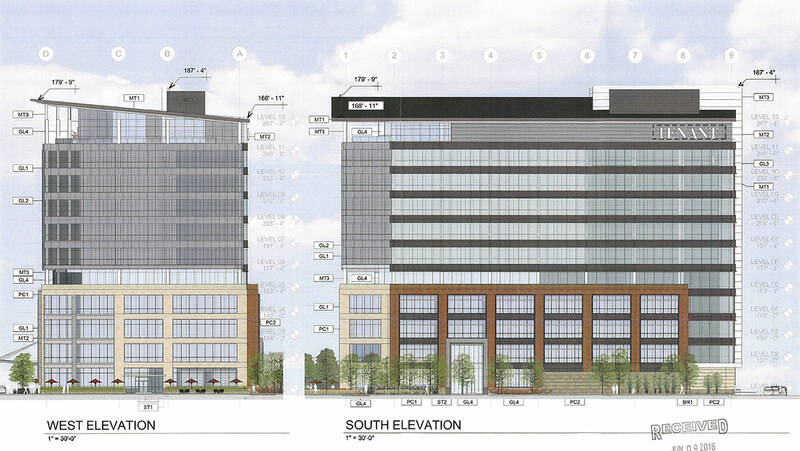 That structure deviated from the original Nucleus master plan calling for a tower at the corner. Broken Sidewalk previously criticized the garage its poor treatment of urban edge conditions. The parking structure was designed by Louisville’s Tucker Booker Donhoff + Partners (TBD+ Architects), the same firm designing the proposed Cambria Hotel a block away, also notable for its lack of street life. innovation is preferred.” An occupiable green roof and other sustainable design elements were also required. It appears from the newly submitted development plan that Building Two meets these requirements, expanding slightly on the building size. Plans show a series of conceptual designs for the new Building Two by Cincinnati’s BHDP Architecture (named the city’s top firm this year) with local engineers at Qk4. The structure’s 325,500 square feet houses ground floor retail with office space above. Ground floor retail is a welcome addition to the Nucleus block. 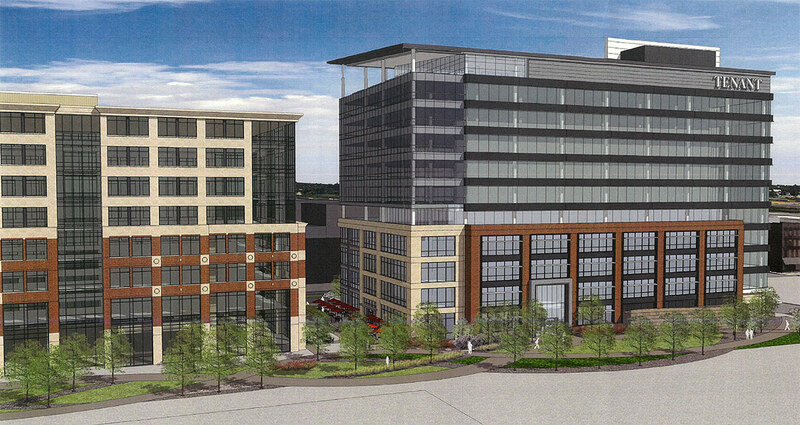 We’ve lamented the lack of retail on of all streets Market Street in previous development. Two retail spaces of approximately 8,000 square feet each are shown flanking the building lobby. Each features outdoor seating for a potential restaurant or cafe. For reference, the average size of a Starbucks tends to be 1,700 to 2,700 square feet while a CVS or Wallgreens ranges from 12,500 to 14,500 square feet. It’s likely these spaces could hold more than two tenants. A 6,800 square foot rooftop restaurant with a large 8,400-square-foot terrace looking north toward the Ohio River is shown on the building’s top floor, marked by a sloped canopy / roof structure. The new structure relates visually to the first Nucleus building via a precast concrete facade massing along Market Street and brick massing details on an interior courtyard. Unlike the older structure, Building Two eschews the traditional detailing on its facade, opting instead for a sleek look dominated by its chamfered curtain wall. Viewed from the east, Building Two appears bisected by a large, vertical blade rising through the roof of the structure, and defining a boundary for the southern curtain wall treatment which features prominent horizontal banding. At both the fifth and 11th floors, the curtain wall is pulled back to reveal sheltered outdoor terraces, a notable amenity of the building. 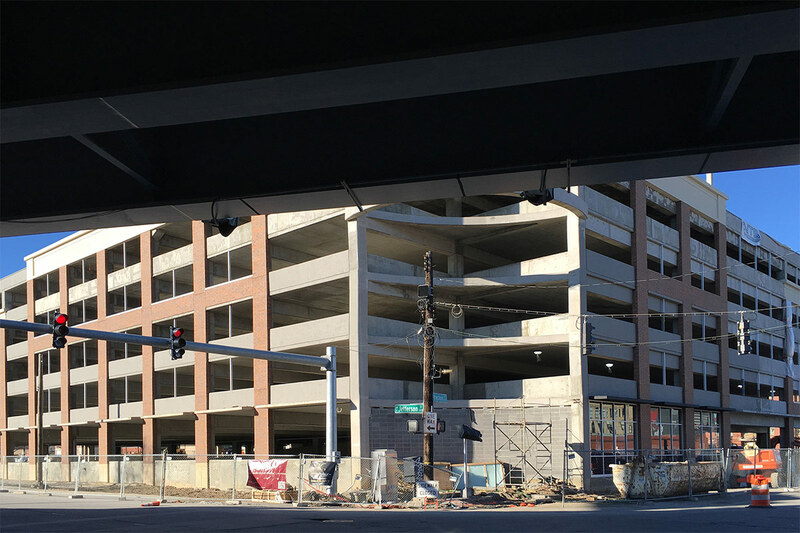 At 11 stories rising to a peak of 180 feet, the new structure is taller than any building in the immediate vicinity, with only the tip of the nearby Preston Pointe a block to the north vying for space along the skyline. There are tall structures here, though, with hospitals to the south of Interstate 65 or Waterfront Park Place a few blocks farther. It’s still hard to call the new building a tower, however. While 180 feet is a significant rise for Louisville, the proportions of the building are wider than tall, giving it a more grounded feel. Still, Building Two, at least in this early conceptual phase, offers a mid-rise design for this long-sleepy stretch of Market Street. It’s scale is sure to be felt and will help make the area feel more urban, closing off the windswept view of Interstate 65 that has long dominated the area. We’ll look at the proposed ground plane design in a future story. The Nucleus block historically was a mix of one- to three-story structures housing businesses related to farming and trade of market goods. Many remember this block as the Haymarket site, where fresh produce could be bought wholesale and retail. The original market site, Haymarket Square, was located just to the southwest, between Jefferson and Liberty streets where an offramp for Interstate 65 now sits. The development of the Nucleus since it began in 2008 had been overseen until recently by Vickie Yates Brown Glisson, the first Nucleus president and CEO and an attorney at Frost Brown Todd. In February, WDRB reported that Glisson resigned her position with the foundation effective March 1 after she was appointed secretary of the Kentucky Cabinet for Health & Family Services last December by Governor Matt Bevin. A replacement for Glisson has not been named and there’s currently no timetable for announcing a replacement, but she remains listed in her former role on the largely out-of-date Nucleus website. Glisson is credited with launching the Nucleus, largely by helping secure a $601 million Tax Increment Financing (TIF) district in 2007 that helps to fund its construction. For me, 11 stories might be more detrimental than good. The downtown area needs infill more than height and will for a long, long time. And is it really that hard to build a mixed use garage? Other cities have plenty and they are great, they don’t break up the street life and arguably even help the garage attract more vehicles. I agree Kevin- Louisville should not allow freestanding parking garages as stand alone structures downtown. They need to be wrapped in retail/mixed use. It’s not difficult- take a look how Denver has tackled parking and growth at the same time. We need to think beyond today, tomorrow and next week. While the cambria hotel design leaves a lot to be desired, that project and this project are providing a whole lot of infill along the East Market corridor. There is the Angels Envy distillery project on the corner of jackson and Market that is getting closer by the day. Its progress.